Musings of a Pertinacious Papist: Wow! Some people are quite disciplined in the matter of wearing a scapular. This comes from Latin scapulae, shoulder blades. Scapulars are garments, usually associated with religious habits, which fall down from the shoulders, mostly over the rest of the habit. 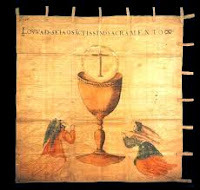 Another kind of scapular is small, on strings, which symbolically substitutes for the larger scapular. There are different kinds of scapulars which are spiritual aids in various ways. They generally are a symbol of a relationship through which we derive spiritual protection and aid. Probably the most commonly used scapular is the brown Scapular of Our Lady of Mount Carmel. 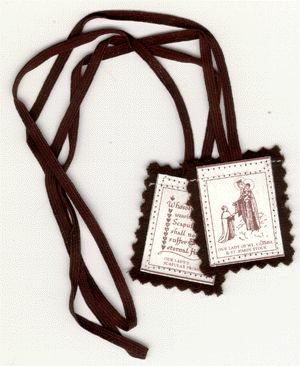 BTW… once you are “enrolled” and given the brown scapular, if and when your scapular wears out, simply replace it. You don’t have to have the new one blessed. I am not sure if Eastern Catholics and Orthodox have such things, but a reader alerted me to something which she thought was rather like a Western scapular. Mormons more "Catholic" than us?